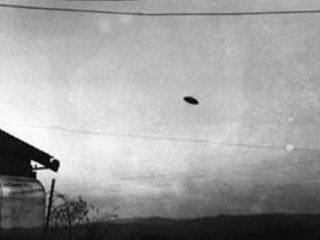 I am sure that we could add more pictures to this list but these are considered ten of the best UFO Photographs ever taken. They have stood the test of time, many have tried to debunk them and they have been examined by experts, tested in laboratories and virtually all of them have been deemed authentic. Feel free to send any addition images that you feel should be included. 1956-Rosetta/Natal, South Africa. July 17. Photograph was taken by a well respected member of South African society. Her husband was a major in the South African Air Force, and Elizabeth worked for Air Force Intelligence. Seven photographs were taken in all. There were also two witnesses to the taking of the photos. Taken in the foothills of the Drakensburg Mountains, and so-dubbed the Drakensberg photos. If these are real, they are extremely impressive. She never changed her story. She died in 1994, at the age of 83. A daytime photograph of a disk-shaped object was taken in East Woonsocket, Rhode Island by UFO contactee Harold Trudel. 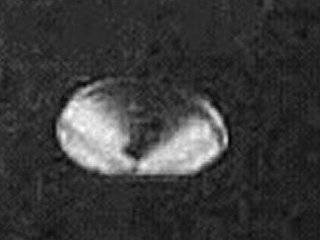 The photograph shows a slightly asymmetric shaped object with a small dome and aerial extending from the bottom. Trudel believed he was in mental contact with space people, who sent him telepathic messages as to where and when they would appear. 1972, Apollo 16, Moon mission dates: April 16-27, CDR: John W. Young, CMP: Kenneth Mattingly, LMP: Charles Duke. Importance of mission: Explored the Moon's rocky central highlands. NASA archives (photo No AS16-114-18423) Mission Apollo 16 on the Moon. 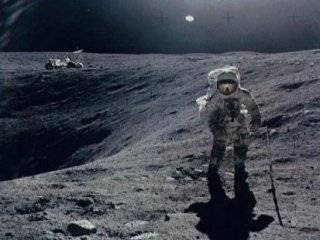 Astronaut Charles Duke photographed collecting lunar sample at Station 1. The UFO is seen at just right of top center. No explanation has been given for the object. Connecticut, 1987. Randy Etting was taking a walk outside his home. A commercial airline pilot with over 30 years experience, he always looked at the sky. On the night he took the photograph, he saw a number of orange and red lights approaching from the west. He got his binoculars and called his neighbors to come outside. The object, by this time was a great deal closer and seemed to be over I-84, just east of Etting's home... the lights were shimmering like distortion from engine heat, but he could hear no sound. 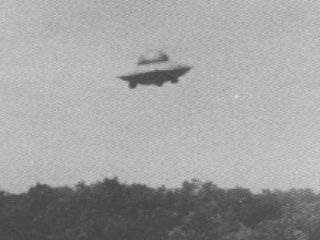 Etting stated: "As the UFO passed over I-84, cars in both the east and west bound lanes began pulling over and stopping. 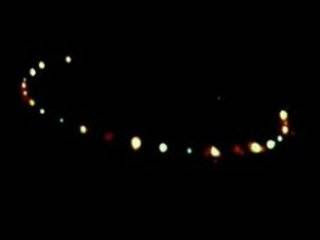 The UFO displayed a semi-circular pattern of very bright multicolored lights. Five motorists reported that, as the object became visible, a number of cars lost power and had to pull off the highway." 1994 December 21. The Carlos Diaz photo gallery is extensive. While taking photos of the eruption of Mt. Popocatepetl in Puebla, Mexico, he shot this photo. It has been authenticated by many photographic experts and published in numerous magazines, newspapers, and books. 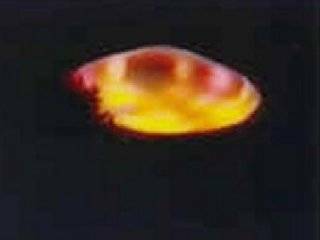 This picture shows a glowing, yellowish, disc shaped object with a red hue toward the top and windows or portholes. Diaz has taken both still and moving imagery of many UFOs. 2004-October. Taken in Valpara, Mexico. It was taken by newspaper reporter Manuel Aguirre. He works for the Mercury newspaper of Valpara. 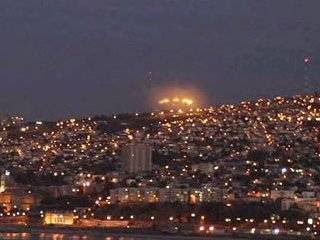 A band of glowing lights is seen in the distance over the city of Valpara. This photograph has not been debunked, and is considered legitimate. The unknown object appears to be circular or spherical in shape. Washington D. C. 1952. 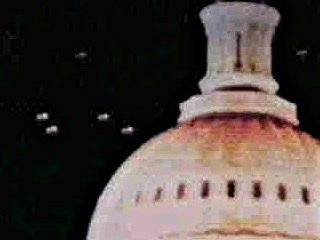 During the dawn of Ufology in the United States, unidentified flying objects made themselves known to the leaders of the free world, buzzing over the White House, the Capitol building, and the Pentagon. Seemingly the unknown objects were defying the very governmental agencies sworn to protect the United States from foreign powers. Washington National Airport and Andrews Air Force Base picked up a number of UFOs on their radar screens on July 19, 1952, beginning a wave of sightings, unexplained to this day. 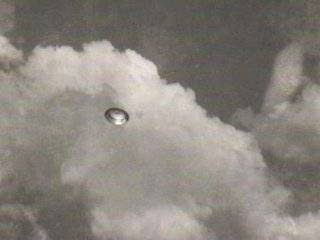 May 8, 1950-This is one of the most famous UFO pictures ever taken. Photographed by Paul Trent, and first witnessed by his wife. They were published in a local newspaper in McMinnville, Oregon shortly thereafter. Soon, the Trent photos were published in Life magazine edition of June 26, 1950. The rest is history. These photos have been deemed authentic for over fifty years. Los Angeles, February 25, 1942, 02:25 PM-Alarm sirens installed in the event of a Japanese air raid are started as flying objects are seen and announced in the sky. A blackout is declared and the anxious and even terrified inhabitants follow the instructions by turning all the lights off. 03:16 PM Anti-aircraft guns open fire on the unidentified flying objects coming from the ocean, and projector beams are searching the sky. Witnesses observe small objects flying at high altitude, of red or silver plated color, moving in formation at high speed, and untouched by more than 150o large caliber artillery shells. This large object was unhurt by many AAA projectiles, according to the reports. 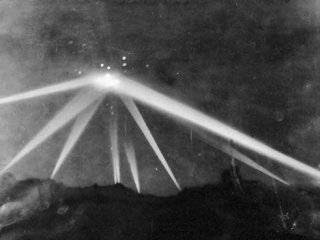 Usually known as photograph from the Battle of Los Angeles. September 4, 1971-An official mapping aircraft of the Costa Rican government took this photograph. The aircraft was flying at 10,000 feet over Lago de Cote. An investigation could not identify the object as a "known" aircraft. Debunkers took some stabs at it, but it is still recognized as authentic by most investigators. No "earthly" explanation has ever been given.